Slice off the bottoms of the strawberries to allow them to stand upright. When you do so, make sure not to cut off so much that there is a hole—the slightest hole will make the gelatin leak out of the berries. Use a paring knife or small spoon to hollow out the strawberries as much as possible. Place 1 cup water in a medium saucepan. Add the blue gelatin and mix to combine the gelatin. Sprinkle 1 envelope of unflavored powdered gelatin on top, let sit for 60 seconds. Mix to combine and then turn on heat to medium-high. Bring to a simmer and then remove from heat. Pour half of the berry blue gelatin (1/2 cup) into a 1/2 cup of the vodka. Set aside. Place 1/2 cup milk, cream or coconut milk into a medium saucepan. Sprinkle 1 envelope of unflavored gelatin on top and let sit for 60 seconds. Mix to combine and then turn on medium-high heat. Add 1/2-cup of sugar. Bring to a simmer and make sure that the sugar is dissolved. Remove from heat. Pour the white gelatin mixture into the remaining 1/2 cup of the vodka. Set aside at room temperature. Do not place somewhere cold, stir it every 10 minutes or so while you are on the next step. Using a spoon, carefully pour the blue gelatin into the strawberries. Fill only halfway. Refrigerate for about 45-60 minutes or until the gelatin is semi-set (firm but still sticky). Fill the rest of the hollowed strawberry with the white gelatin mixture. Refrigerate for at 3-4 hours. When fully set, slowly slice each strawberry in half from the top down. Place them on mini sticks or skewers. Keep refrigerated until serving. 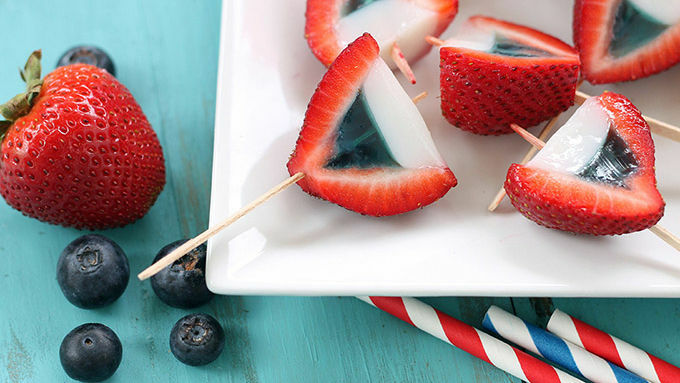 Strawberries get all patriotic in red, white and blue with the help of some yummy spiked gelatin. How do you take a good thing (jelly shots in strawberries) and make it better? Add more color! Even better, AMERICAN colors. These little filled bites looked so ready for the 4th that we almost called them ‘merica jelly shots! 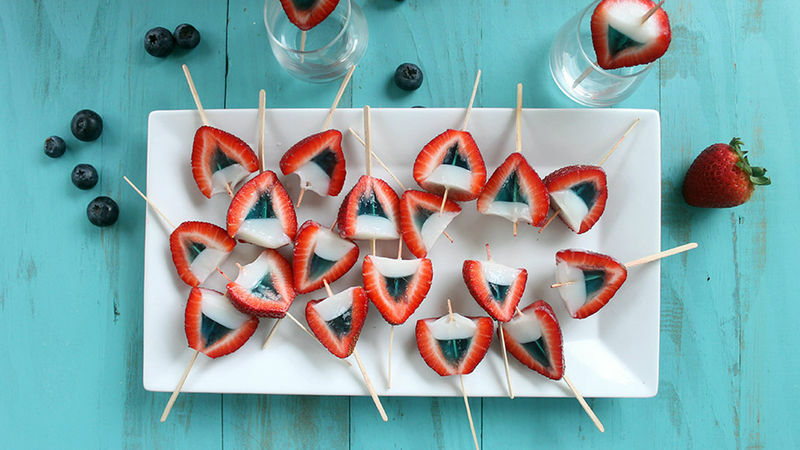 With bright red strawberries, and white and blue gelatin filling, these couldn’t be cuter or more party perfect. I’ve been brainstorming on this forever and I wasn’t sure how they were going to turn out, but I think they are perfection. Since no one really eats a whole huge strawberry all at once, these strawberry halves are perfect one biters. You can arrange them in a circle, square or even a star on a serving plate for the perfect presentation. Give them a try this 4th of July—or Flag Day, Labor Day, Veteran’s Day, or Memorial Day—or ANY day you’re feeling the spirit!